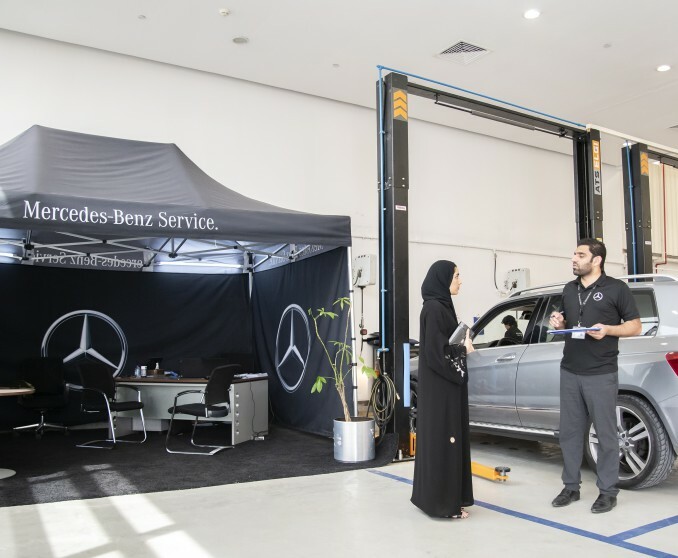 In line with the UAE’s target of reducing fatal road accidents to 3 per 100,000 people by 2021, EMC PC and Eastern Motors held the Mercedes-Benz Service Week in conjunction with road safety staff trainings. The Service Week agenda included a free 25-point safety check, informative accident prevention tips highlighting the sophisticated safety features of Mercedes-Benz cars, including collision avoidance technologies. Meanwhile, the employees’ training covered rules of the road for pedestrians and drivers. Both, EMC PC and Eastern Motors, offer a wide range of powerful Mercedes-Benz models that are equipped with the latest safety features, most advanced technologies, accompanied with top aftersales customer service support from a Mercedes-Benz certified team of experts. Additionally, EMC PC’s and Eastern Motors’ Service Week goals are perfectly in line with ALFAHIM Group’s CSR pillars that focus on health and safety. Extending the road safety campaign among staff members helps in further emphasizing the importance of regularly checking the vehicle, understanding new traffic rules, and promoting safe driving.